The Symbols feature in Storyline allows you to easily add characters that aren't normally on a keyboard, such as copyright symbols, trademark symbols, paragraph marks, accented characters, and Unicode characters. Create a text box, shape or caption on your slide, or select an existing one. If there's already text in the object, place your cursor within it. 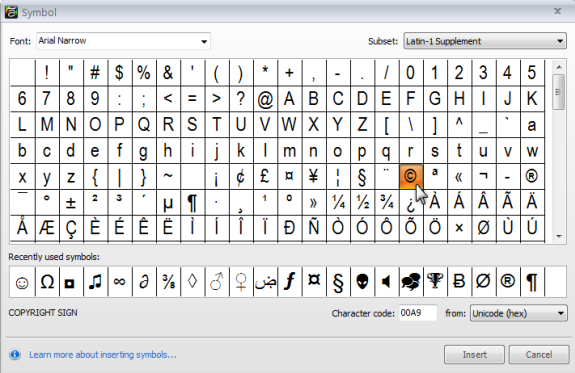 Browse additional symbols by choosing a different font from the Font selector in the upper-left of the window. Choose a different character set in the from: selector in the lower-right of the window. If you've chosen the Unicode (hex) character set in the from selector, you can also choose a different Subset of characters in the upper-right of the window. If you know the character code, you can enter it in the Character code field directly.